The DATEL Business Unit of Murata Power Solutions announced the introduction of a new line of digital-to-analog converters. The reliable DAC-88 series are 12-bit, 3µs DACs housed in a small hermetically sealed 24-pin DDIP or SMT gull-wing ceramic package. Each unit features guaranteed monotonicity and is 100 percent tested for performance across one of three specified temperature ranges: 0 to +70°C, -40 to +100°C, and -55 to +125°C. The DAC-88 has an input register for versatility in many applications. Other key benefits include the choice of binary or two’s complement input coding, and voltage-out capability. With excellent Differential and Integral Non-linearity specifications, the DAC-88 has been an industry standard family of data converters, and is still a good choice where precision and fast analog output settling speed are required. Output range is programmable to 20V, and includes bipolar options as well. Very tight resistor thermal tracking equates to DNL tempco of +2ppm maximum, which assures reliable performance over the full operating range. 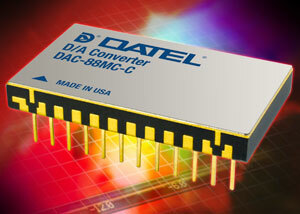 The DAC-88 series is manufactured in DATEL’s USA facility, which is certified to MIL-PRF-38534 standards. The device is available in commercial as well as military/high-reliability versions, and is pin-for-pin compatible with the DAC88, HS3860, and MN3860 series. RoHS and non-RoHS versions are available. Both 883 and DSCC/DLA-compliant models are included in this family and are available under drawing number 5962-9057001HXA or 5962-9057001HXC.